Catalan Independence and the Silent Majority: Wishful Thinking or An Exercise In Propaganda? One of the upshots of last Friday’s anti-Independence demonstration in Barcelona is that the right-wing Spanish parties have started using the expression the ‘Silent Majority’ to refer to the Spanish-speaking Catalans who would prefer that Catalonia remained part of Spain. As far as I’m concerned, whether they’re silent or not is up to them but I do take issue with the word ‘Majority’. In comparison with the pro-Independence Diada, the Dia de la Hispanidad demo was very poorly attended however you look at it. 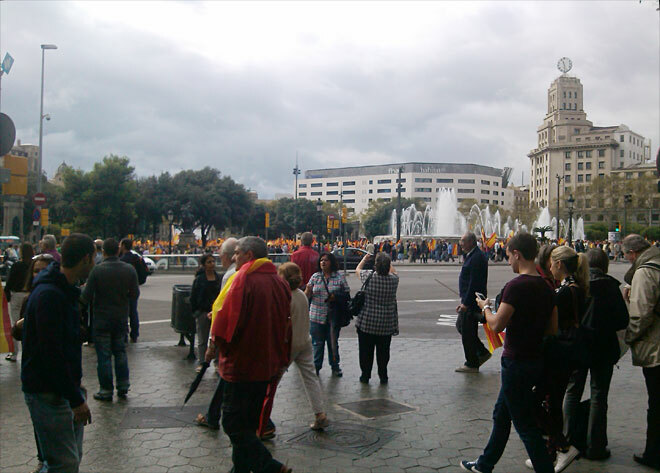 I wrote a blog on the morning of Friday 12 October suggesting there were only around 3,000 there, because the area surrounding Plaça Catalunya was so empty. However, the Guardia Urbana suggested 6,000 so as everyone seemed to crammed into the centre of the square just in front of the stage, I’m prepared to go along with that.